After enduring a lot of challenges in life, senior citizens definitely deserve the best kind of treats…including low-priced supermarket items! That’s why we’ve listed down all available supermarket promotions for senior citizens in Singapore. Wherever your neighbourhood may be, there are supermarkets like Giant that offer amazing deals for the elderly. Giant lives up to its name in more ways than one. It has 62 stores in Singapore (hypermarket, supermarket, or express store) and an online store. It promises huge savings, particularly with its Dare to Compare promo that features the lowest value for high-quality products. 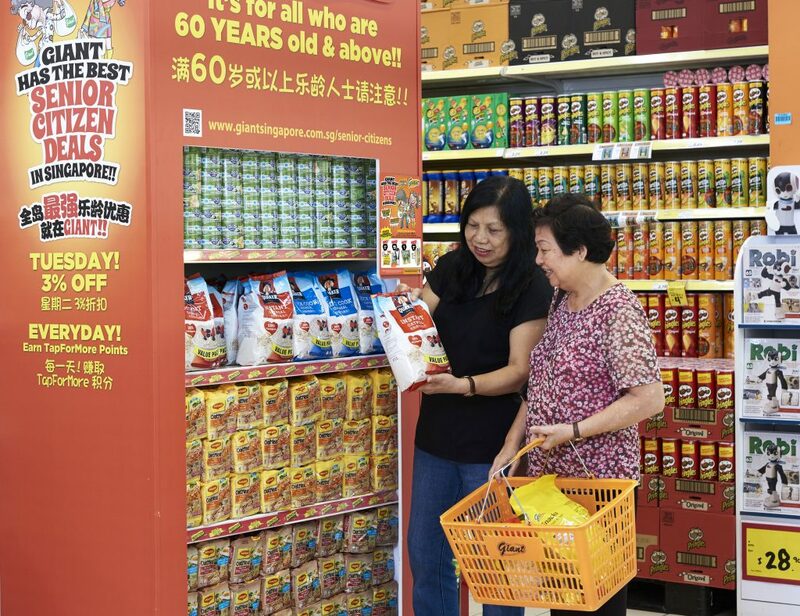 For all Tuesdays, senior citizens get 3% off their grocery items at over 60 Giant stores islandwide, except on statutory products and purchases from concessionaires. Entitled for the discount are seniors aged 60 and above, with no spending limit. Promotions not valid for online purchases. Giant also keeps things exciting by offering four new exclusive deals for seniors every week, from Wednesday to Monday! Savings vary each week, so they shouldn’t forget to check out the promotion details with every visit to Giant. Senior citizens must use their PAssion Silver Card so they can redeem their PAssion TapForMore points to get instant discounts.. For every $1 they spend, they will be rewarded with 1 PAssion TapForMore point. The more they shop, the more they get in return! Founded in 1903 (and older than any of us), Cold Storage is known to have opened the first supermarket in Singapore in the 1960s. It started as a small store carrying meat and dairy products. It has since grown to become the big retailer it is today. Cold Storage is far from cold to seniors. The store prides itself with hot deals that make shopping a fun experience. And with their PAssion Silver Card, they can get 3% discount on their purchases every Wednesday. Bonus: They earn PAssion TapForMore points as well! Every Tuesday, NTUC FairPrice shaves 2% off grocery bills for seniors above 60 years old. Members of the Pioneer Generation (PG) are also eligible to receive 3% discount on all Mondays and Thursdays of 2017 (subject to a $200 cap and excludes statutory items). They can also line up on designated priority payment counters for faster queueing. They only need to present their PG card to avail of these perks. Prime Supermarket claims to be the largest family-owned supermarket chain in the island state and was one of the first stores to operate for 24 hours. According to this blog, Mondays and Fridays are auspicious shopping days for senior citizens aged 60 and above at Prime Supermarket. On these days, they are entitled to 3% discount off all products except liquor and cigarettes. Another local chain that soared and became highly successful is Sheng Siong, now with 43 branches in Singapore. Senior citizens can shop at Sheng Siong every Wednesday to enjoy a 3% discount (subject to a $200 cap), according to this article. Customers aged 60 and above are qualified for this promo. It offers 3% discounts, higher than other supermarkets that stop at 2%. It features exclusive senior citizen deals for three days (Wednesday to Monday). That’s not all! At Giant, there are more ways to score unbeatable deals. One way to reduce shopping expenses is through credit card payment. Credit cards offer a varying percentage of rebates across most supermarkets, plus loads of other offers. In Giant, for example, using UOB Delight Credit Card offers up to 8% rebate and up to 10% discount for over 4000 products under Giant Housebrand and Giant Top Picks, Cold Storage and Guardian Housebrands. Seniors must also keep their PAssion Silver Card with them at all times to claim exciting deals and get reward points which may be used later on. Of course, signing up for the Giant Super Savers Club ensures our senior citizens get first dibs on the latest Giant deals and promotions! Here is a list of cool and unique senior citizen benefits in and out of Singapore. These are the things that seniors must keep in mind to ensure a fuss-free and fun holiday. Discover the amazing benefits of being a PAssion Silver Card holder—all 10 of them! Check out this comprehensive list of benefits for senior citizens in Singapore—from healthcare to housing, from recreation to grocery shopping.